Flowering crab trees, also called flowering crab apple trees, are popular yard and landscaping trees because of their beauty and relatively low maintenance requirements. However, in order to get the most beautiful blooms out of your crab tree and the longest life, you should understand what makes these trees "happiest." Understanding when and why your flowering crab tree reacts to certain things will help you keep your tree healthy and happy for years to come. Flowering crab trees have been popular forever, which may help explain why there are more than 700 cultivated varieties. Some of the most popular and well-known species of flowering crab tree include the Siberian crab tree, Tea crab tree, the Japanese flowering crab tree, the Zumi crab tree and the Sargent crab tree. Flowering crab trees blossom with five petals that grow in clusters. They have bright yellow stamens and light pink to hot magenta to red petals. They tend to be 15 to 30 feet in height, but can be as short as 6. Their shapes are largely dependent on pruning--or lack thereof--but there are some species of weeping flowering crab trees. Flowering crab trees will bloom in the spring as far north as Michigan and New England. This makes them very popular as most other "spring bloomers" cannot survive the harsh winters. They are able to tolerate winters as far north as USDA hardiness zone 4. 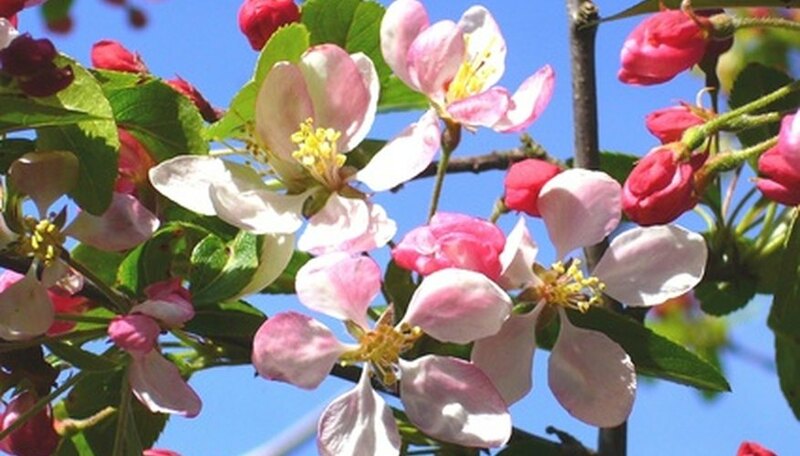 Flowering crab trees need a rich, loam soil and good drainage, as well as eight to 12 hours of sun a day for maximum blooming and fruit production. They do not generally need to be pruned unless it is cosmetically desirable or they are interfering with other landscaping. However, weeping varieties may need shoots that are growing up to be periodically removed to help them keep their flowing shape. Crab trees generally will not require fertilizer or additional watering, but if your flowering crab tree is growing less than 5 inches or is less than a year old in a drought condition, then you should water and fertilize. Fortunately for flowering crab tree lovers, most of the species on the market today are disease-resistant. However, if you have an older flowering crab in your yard, then you will need to look out for dark, scablike formations on the branches and trunk, which can indicate the presence of apple scab fungus and fire blight, which turns branches black and eventually will kill the tree. Japanese beetles often attack this tree, but, unlike most of this beetle's prey, the tree seldom experiences significant damage.